Funded by Farah Pahlavi and the American Revolution Bicentennial Administration. Politics and war, fueled by greed, racism, hatred and stupidity have done more damage to our knowledge of ourselves and the understanding of of others than any other force. This book is an example of the type of knowledge that has been lost over and over again throughout history and continues to this day. This book was published as a gift to the American people from the government of Iran and Farah Pahlavi, the Shahbanou of Iran in 1976 when we were friends with Iran. A few years later this gift of knowledge would have been impossible to produce and perhaps lost. This review is being written while we are yet again on the verge of war against Iran's neighbor Iraq. What knowledge of civilization's development and ancient cultures will we destroy in our greed for oil and satisfying a petty leader's revenge? The oil will run out, revenge is never satisfying and is no reason for a country to go to war. Knowledge can be handed down forever if it is not lost. of the American Bicentennial "
THIS book is primarily about ancient forms of locks made in Iran, particularly padlocks, but it is also about the people that used these locks for both security and in cultural practices. THE various types of mechanisms are diagramed and an attempt is made at placing the types historically. THIS is probably one of the best records of early lock mechanisms published to date. 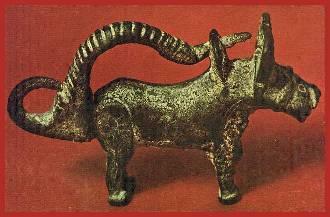 Cover Illustration: Bronze water buffalo with barbed spring mechanism. 8th to 10 centuries. 6.4 x 4.5 cm. 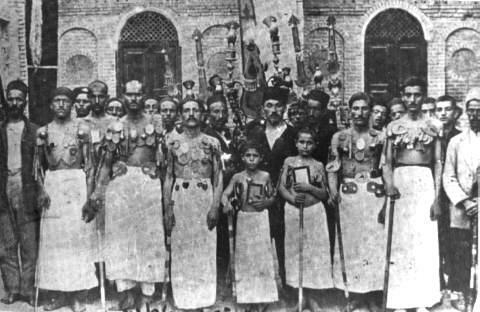 Lock wearers taking part in a religious ceremony. CULTURES AND Religions produce some very interesting customs. 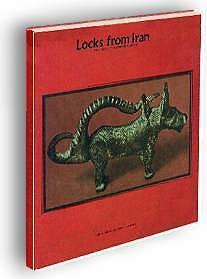 This book describes customs that resulted in Iran developing many early lock making centers and unique lock designs. 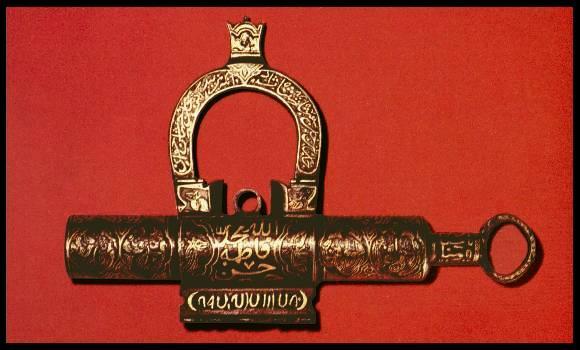 Locks were used as magical charms and talismans as well as religious symbols. The "lock wearers" have locks piercing their skin as part of a mourning ritual. MASTER Locksmith Taqi of Chal Shotor in his workshop. He is using tweezer style tongs and a loose animal skin bellows. His forge is a simple pit lined with clay. He works squatting or sitting on the ground in the Eastern manner. 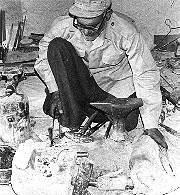 HIS 20th century shop, tools and the methods of working have not changed in hundreds of years. The small forge will be used to heat iron and steel for forging as well melting brass and bronze. Click locksmith images to enlarge. ARRANGED against the wall is a collection of large files of various types. Files have probably been one of the most important tools of the locksmith. As late as the 19th century large manufacturers in Britain had workers that did almost nothing except sit a a vise and file lock parts. 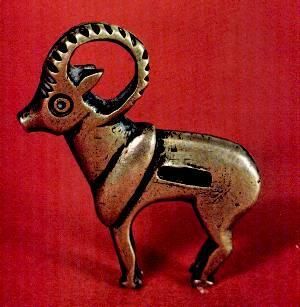 BRONZE Padlock in the shape of a ram. TYPICAL of many locks and keys in collections there is no matching parts. The shackle and key are missing. There are thousands of bronze Roman era keys in collections but almost no locks. This is due to the durability of the keys which did not rust away and were often kept long after the lock was gone. In more modern collections of old locks either the lock or the key are found but rarely a pair. 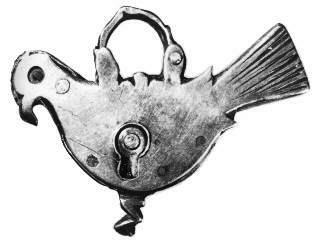 IRON Padlock in the shape of a bird. NOTICE The faint indications of the finished flush rivets holding the lock together. Shouldered rivets in counter sunk holes have been used this way for millenia. The parts in a modern brass padlock are held in place with tight fitting pins that are cut flush to the surface and invisible to the untrained eye. On padlocks worth repairing or rekeying modern locksmiths remove the pins with a pin punch then replace them with new pins, file them flush and refinish the lock to look like new. TWENTY-NINE Diagrams of different types of locks are used to define the various types. Each diagram shows the lock in the closed and open position, the shape of the key and intermediate diagrams when needed. The following examples are four of the simpler mechanisms. PUSH KEY SPRING locks of numerous types are illustrated. Above is the simplest type. Others used key holes where the key has to be put in one way then rotated before pushing to compress the expanded spring. Another type used a key that had to be threaded (turned like a screw) through the keyhole before pushing to release the shackle. 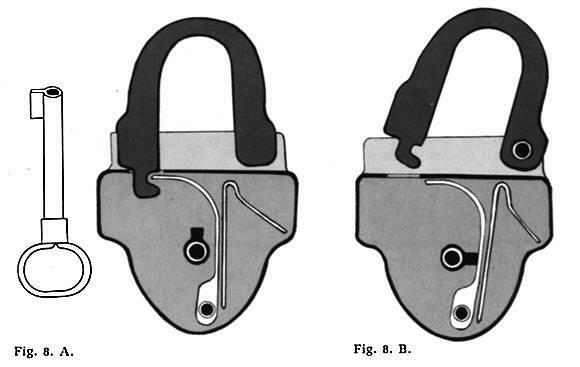 SPRING AND Lever padlocks of numerous types are illustrated. Again, the simplest type is shown. This one has the familiar hinged shackle, others had removable shackles. 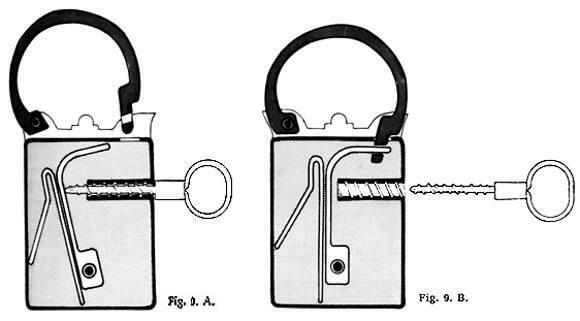 The examples had the standard variations, plain bit, barrel key, shaped keyhole (ward). There were also multiple key locks requiring as many as four different keys. This simple form of padlock has been mass produced world wide and is still manufactured. SCREW KEY padlocks of numerous types are illustrated. These are a variation of a another type that used a simple push pin key. It is obvious that a push pin will open this lock (if you have one). The only advantage of this type screw lock is symbolic and that the key is retained in the lock once opened. DIAL COMBINTATION locks are often classified as a puzzel lock. The characters on the dials can be numbers, figures or symbols in any order. 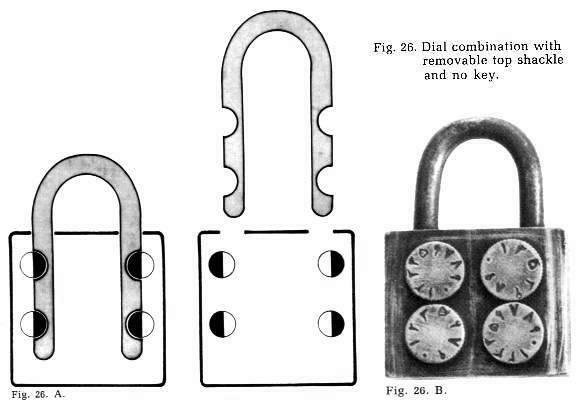 This particular lock design is interesting because it can be made primarily by drilling holes and cold working the metal (sawing, bending, filing). Page 136 : Lock No. 388 steel Chal Shotor with helical spring mechanism, 18th century. Width 29 cm., height 24.5 cm. (11.4 x 9.6"). WHAT should pique the interest of the modern locksmith or blacksmith is that all the locks shown are the product of a small shop or smithy. 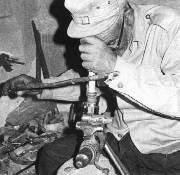 At one time locksmithing was part of the blacksmith's art and forging and casting that of the locksmith's. Used copies selling for $24 to $75 USD.